So back when I was working on my MLIS, I came across an article about a book, Daisy Kutter and the Last Train by Kazu Kibuishi, and how it could be used in the classroom. The article kept talking about how this type of book was called a “graphic novel,” due to the fact that it was an illustrated story. Given my background in art...color me intrigued. The bits of the story and the images shared in the article made me buy the book sight unseen from Amazon....and I was blown away. The story, the art, it all worked together in perfect harmony to create this fantastic journey that captivated me. I remember showing my family, friends, coworkers...and basically anyone else I could trying to get them as excited about the book as I was. And that’s when I discovered it...the problem with trying to get other people excited about graphic novels, is that they look at them as just big comic books or worse “picture books” for kids. It’s a problem that I’ve had to battle time and time again since then. [Editor’s Note: Me, too. Countless times.] And I’ve finally come up with a good way to talk about it. It seems as if the biggest problem people have with graphic novels, is that they’re pictures with words, so that means it’s a kids’ book. Or it’s about superheroes, so it’s a comic and pfff there’s no way comics can be real literature. Because for some reason we keep equating pictures to a lower level of reading. I don’t know when this type of thinking became common, but frankly it’s the biggest lie that someone has ever told. Why’s that? Because the ability to read images is the oldest language in the world. Seriously. We’ve been using images with cave paintings, stained glass windows, political dissent paintings, political cartoons, road signs, door signs all to convey a story or a message. Images are our universal language. It’s why so many symbols across the globe are easy to recognize. We understand them, regardless of language, age, gender, or anything else. There’s a greater power in a single image than a thousand words. Memory, emotions, smells, touch, all of our senses are engaged with one image. For example, pull out a picture that you’ve taken. Just think about it for a minute. How many pages could you write about what that single image conveys? Where you were, who you were with, what you were feeling, what you were thinking, and on and on. That’s the power of a graphic novel. And that’s how the collection I built started. A small tiny crack that was already there and I built upon it and kept building. I snuck in some that were YA, because who was going to look twice at a picture book in that section? I was able to sneak in some adaptations of Shakespeare's plays because I could say they help different reading styles. Don’t try to say “No they don’t” because they do. I remember trying to read plays and I’d get overwhelmed with the way they were laid out. And it went on like that for pages and pages. It was bad enough trying to figure out some of the words used during that time period, but just seeing it laid out like that...my brain could just barely handle it. And then I found the graphic novel adaptations and everything came to life for me. I didn’t have to worry about reading the queues written as words, I could focus on the characters and read them! I could see how they were acting and reacting and what they were saying and it all made sense. And there are countless other readers out there, yes older readers as well, for whom reading it in a graphic format makes things come alive. The collection grew even more when a professor said, “Hey, I’m going to teach a course on graphic novels. Do you think we can order more of them?” That’s when the floodgates opened. I was able to buy the books that students had been begging for. Ones that challenged our notions of thinking, that told history in comic format, that told stories, or just entertained and helped the reader escape the day to day for a few hours. I bought graphic novels for all areas: fiction, nonfiction, biography, science, history, sociology even economics. As long as the books were rated well, I bought them and encouraged students and teachers to use them as sources, for extra knowledge, whatever to get them used. That’s how it began for me. Every place is going to be a little bit different but there are some solid rules to get the collection started no matter what type of library you work in. Every book has it’s reader. I know that sounds trite, but seriously we buy books that many of us would rather never see, but our readers like them. The same holds true for graphic novels. Readers like them, why not buy them? Just because the book is written in pictures, doesn’t mean it takes less skill to read it. In fact there are studies that prove that it takes more effort to read and process an image, because you’re focusing on so many different factors all at once. The position of the character, their facial expressions, what happens in the gutter spaces (those white spaces between panels) and more. There are entire books written about reading comics. Go check out Scott McCloud’s books to learn more. Partner with people. Whether you’re in a school, university, community, whatever, get other people that want graphic novels to start talking about them - especially to each other. Get them to pester others at the library or start a petition to get a collection started. Members of your community are the best resources that you have. Start small. Once you get permission, don’t try to buy everything out there unless you were told you could do so (and if that happens, you’re very lucky.) Find out how much you can spend and make a priority list of what you want first. Have a policy. It doesn’t have to be a long one, maybe just a couple of paragraphs, but it helps you start building the collection. One of the things on my initial list: no long running comic series and no manga. This annoys some of my patrons, but I’m limited by cost and space. I can buy stand alone comics: All-Star Superman, the Killing Joke, etc. and I’ll buy short run manga series: Buddha for example, but otherwise we have to wait. Sell the collection as a way to support education. Tie it into what’s going on in the community. Big movement to study other cultures in the schools or community, or people of diverse backgrounds? Buy books like: American Born Chinese, A Home for Mr. Easter, Kampung Boy and more. Need books in the sciences? Books like Primates, Genius, Laika, Feynman, and others fit in nicely. Those are the basics of what I can offer. 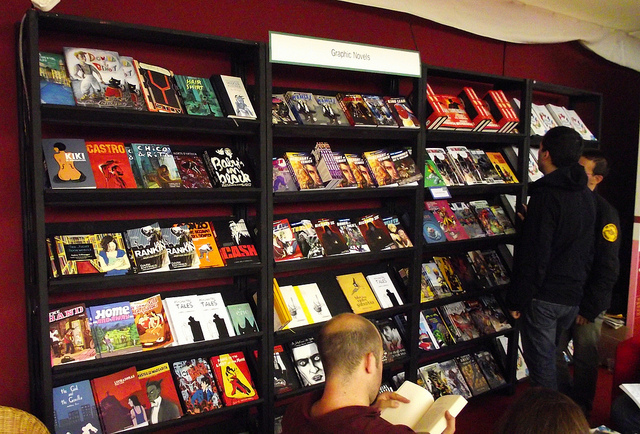 Yes there will still be people that claim that graphic novels “aren’t real books” because they have pictures. If they do so kindly point them towards March Book 1 by John Lewis, the last living member of the big six that helped plan the march in Washington with Martin Luther King, Jr. He is the first politician to tell his story in graphic novel format, and was a leader in the civil rights movement. Have they naysayers look at the words and the images and the story they create. Sure they could read about what it was like for Mr. Lewis and others to have water thrown on them, smoke blown in their faces, to be cursed at and shoved, all while not losing their tempers. It’s another thing to see it depicted in pictures. That’s the power that a graphic novel brings. Andrew Shuping is currently the Interlibrary Loan & Public Services Librarian at Jack Tarver Library, Mercer University, Macon, GA. He has been involved in libraries for over nine years and collecting graphic novels for over seven years. This is his second post for LtaYL; his first was The ILLbrarian is In. Andrew can be found at ashuping.net and goes by the user name ashuping where ever he can, such as on Twitter: @ashuping.